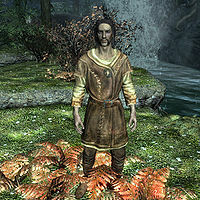 Maurice Jondrelle is a Breton monk who shows up in the Temple of Kynareth in Whiterun during the quest The Blessings of Nature. If Maurice overhears you talking with Danica Pure-Spring about going to the Eldergleam, he will ask to accompany you. He carries nothing but the clothes he owns—a belted tunic with boots. Maurice: "What is it... what has happened to the Gildergreen? I have traveled long here to worship beneath its branches." Danica: "It was taken by a lightning strike. Wish I had time to deal with it, but it's hard enough with all these wounded from the war." Maurice: "Please, don't just let it stay like this. It's disgraceful." Danica: "I really don't have time to deal with you right now. Please just let me get back to my work." Maurice: "But this is supposed to be your work." After you have shown Danica Nettlebane, Maurice will seek you out and say: "Was I correct in hearing that you were traveling to the grove of the Eldergleam?" He will then introduce himself: "I am a traveler. A pilgrim. I follow the voice of Kynareth wherever it can be heard. I've dreamed of seeing Eldergleam for years. Might I travel alongside you? I promise not to get in the way." If you say no, he will understand: "I understand. Some journeys must be taken alone. I'll be here if you change your mind." If you accept, he will tag along with you with the words: "I thank you for your kindness." On the journey, and due to his aggression, Maurice will attack all enemies, regardless of his lack of weapons and can be a challenge to keep alive; however, he provides a much more peaceful option in the Eldergleam Sanctuary, so he is worth looking out for. During the trip, Maurice will spontaneously comment on the state of the Gildergreen, saying: "What's happened to the Gildergreen is a travesty." or simply show his impatience: "Is it much further to the sanctuary?" Once you are inside the sanctuary, an overwhelmed Maurice will comment: "I can't believe I've finally made it here. ", "It's like it was in my dreams. ", "I can almost hear its heart." and "Please move quickly. Eldergleam awaits us." "I think I can convince the tree to help us." However, once you pull out Nettlebane, the peace-loving monk will realize what is going on and will start to lift his hands. When you have cut all the roots, thus giving way to the Eldergleam tree itself, he will angrily run up to you: "I had no idea you were a man/woman of violence. What exactly are your intentions in this blessed place?" When you explain that you need sap from the tree, he will say: "You would violate this marvel of Kynareth's glory to fix that half-breed stump in Whiterun? That's abominable. Barbaric. I'll have no part of this. Why didn't you tell me what you intended?" If you ask him to stand aside, he will warn you: "With pleasure. Nature has a way of finding vengeance, though. You walk a bleak path, friend. One that will lead to suffering." This will also cause him to attack you when you have cut the Eldergleam to extract the sap. If you instead choose to ask him if he's got a better idea, he will say: "Well... yes. There is something. It won't repair the tree back at the temple, but we could bring them a new one." Once again, you can choose to reject his offer and he will say: "Very well. I can't stop you. But I can't bear to watch it, either." If you accept his peaceful solution, he will say: "Follow me. I think I can convince the tree to help us." Maurice will then run up to the tree, kneel before it and a sapling will appear in front of him. 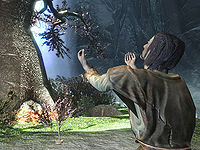 He then tells you to bring the sapling to Danica: "The Eldergleam has blessed us with a sapling. You should take it to Whiterun. Danica will want to see that the true blessings of nature lie in renewal, not a slavish maintenance." He then reveals that he plans on staying in the sanctuary: "I believe I'll stay here and bask in Eldergleam's warmth a bit longer." When you thank him for the help he will finish with: "It was my pleasure, friend. In a way, I envy you getting to carry such a direct sign of Kynareth's graces." Maurice will then start a new life in the sanctuary and enjoy the peaceful atmosphere with the other worshippers. He will randomly eat and sleep and will spend the rest of the day wandering around. Attacking Maurice counts as an assault and adds a 40 gold bounty in Whiterun. If Maurice does not run up to you after you have cut the last of the roots on the way walking back down the path to him may cause him to initiate the required conversation. If a battle is initiated while you are sneaking, Maurice may never stop sneaking after the battle is over. This page was last modified on 22 June 2018, at 04:54.